The web resource for the Digitising the Edwin Morgan Scrapbooks project was launched on Friday 20th January, the first major UK study to explore the concept of diligent search since the EU Orphan Works Directive and UK Orphan Works Licensing Scheme came into effect. The resource, found at www.digitisingmorgan.org, explains the obstacles in current copyright law which make the digitisation of cultural heritage collections so challenging and expensive. It was developed by the Project Officer Kerry Patterson, PI Professor Ronan Deazley (Queen’s University Belfast) and PhD student Victoria Stobo with Digital Resources Officer Peter Bennett and Data Specialist Jesus Rodriguez Perez. 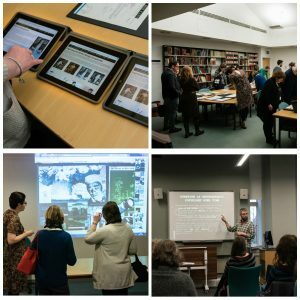 On the launch day, the project team delivered a training session to colleagues from the cultural heritage sector on Digitising Photographs: Copyright Duration and Diligent Search. This was followed by an evening launch in the Level 12 Reading Room of the University Library, where guests could view the resource alongside the scrapbooks and associated material from Morgan’s personal papers. The launch received press coverage in The Herald, the Scottish Review of Books, The National and Scotland on Sunday. Firstly – Thanks for coming to resource launch – hope you will enjoy trying out the web resource on the ipads. The web resource contains the fruits of the project – the research, materials for practitioners and an interactive version of the scrapbook where you can explore a sample section of Scrapbook 12. Also do have a look in the reading room where you will be able to see Scrapbook 12, which was the focus of the project, as well as other scrapbooks and related material from Morgan’s papers. However the more you see of the Scrapbooks, the greater the frustration you feel that it is so difficult for amazing items like these to be shared online. Morgan spent 30 years creating the scrapbooks and always wanted to have them published. His first efforts were in 1953 when he approached a literary agent – this was before the 16 volumes were even finished. He tried again in 1988 when he had an established relationship with his publisher Carcanet. Although there was some interest in potentially producing an edited version covering the war years, the project was essentially dismissed as too difficult and too expensive. Those problems still remain. Clearing rights takes time and money, which many institutions do not have to spare. Digitising a work like the scrapbooks involves two substantial issues – firstly, the costs of clearing rights for works where we know the rights holder and secondly the costs involved in dealing with orphan works. At the heart of this project is an investigation into the issue of orphan works – those works where we do not know or cannot find the rightsholders. It explores the two routes available for using orphan works – the EU Directive and the UK’s own Orphan Works Licensing Scheme. I won’t go into the details of the two schemes now – you can read that on the website! But, they were introduced in an attempt to provide a way for organisations to legally use orphan works. So how effective are they in the case of the scrapbooks? There are an estimated 51,000 individual cuttings across 16 volumes of scrapbooks and around 53% of those are orphan works. To do the necessary diligent search for those cuttings would take one person 8 years and cost £181,000. That doesn’t even include the cost of clearing rights for cuttings where we do know the rightsholders – the other 47% – during the project we were quoted figures ranging from £15 to $2,000 for an individual cutting. These costs – and importantly, the time spent, are intimidating for any organisation. However these figures are not unusual for cultural heritage institutions who want to digitise their collections. Due to this situation, what we see happening is that digitised material from museums and archives that typically appears online is absolutely skewed towards material made before the 20th century. If this continues, the more recent material falls from the view of online users, who make up a growing proportion of overall users. Then, our digitised cultural heritage will not represent what is actually in our collections and the richness of collections will not be visible. This project has allowed us to be bolder than an institution may feel they can be alone. For example, we have used material without payment, where a fee has been requested. If you look at the Copyright statement which appears at the bottom of every page of the resource, you can find out more about the decisions that we made and the reasons that we made them. Such as, relying on sections 29 and 30 of the Copyright Designs and Patents Act 1988 that permit use for non-commercial research and for the purposes of criticism, review and quotation. We hope that by being bold, by providing research data that can be used to support the need for the situation to change and by providing information to help cultural heritage institutions negotiate the current laws, that we can enable more material like the scrapbooks to appear online and we can avoid slipping further into the ‘black hole’ where works created in the 20th century and after, are missing from our online cultural heritage. “CREATe is a research centres that aims to produce useful stuff. Our engagement with Galleries, Libraries, Archives and Museums, sometimes called the GLAM sector, has been led by Prof. Ronan Deazley, now at Queen’s University Belfast. The results of a significant project will be launched today, the critical digitisation of excerpts from Edwin Morgan’s 16 scrapbooks. Although the scrapbooks undoubtedly are glamorous, in a faded way, our preferred term for this disciplinary field is not GLAM but “cultural memory”. Collections are part of a social construction, of collective sense making. Copyright law plays an important, and little understood role here. It constrains and shapes what we see. The Edwin Morgan Annotator tool makes this visible for the first time, allowing the user to set an infringement risk filter.